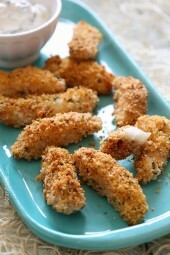 Bake them in the oven or the air fryer, directions provided for both! Firm meaty cod fish holds it’s shape perfectly during baking or air frying. To get a crisp golden flavorful crust I combined panko crumbs with a little Old Bay and spices to get a faux-fried coating without the need to deep fry. I’m a dipper, I love dipping my food in condiments, and was really happy with how this lemon caper sauce turned out – you can really taste the fresh chives and lemon, which is the perfect compliment to the fish. Although there’s nothing like catching your own fish, that’s not always possible. So when purchasing seafood, I always look for sustainable options, whether it’s fresh or frozen. The first time I heard the term “sustainable seafood” was a few years back in San Francisco at an Alaska Seafood cooking demonstration where I learned that unlike many of the world’s other fish populations, Alaska’s are managed for protection against overfishing ensuring a healthy, wild and sustainable harvest for our future generations. So when I see the Alaskan Seafood label, I know I’m making a sustainable choice. 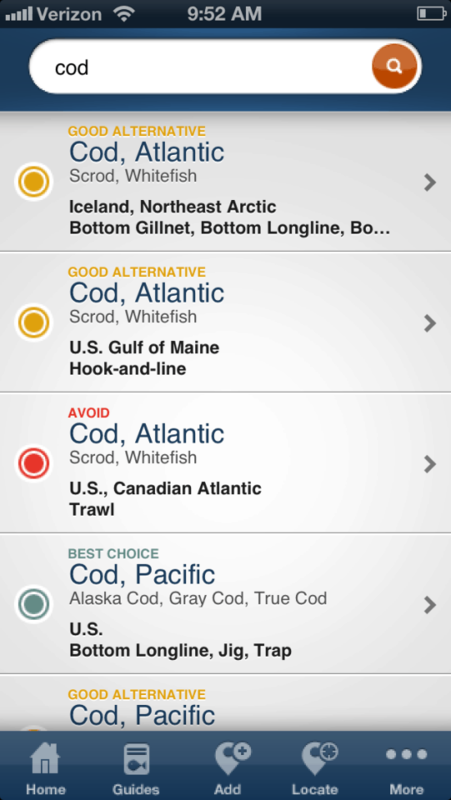 I also have the (free) Seafood Watch App on my phone which I LOVE and always refer to before purchasing fish. It’s simple to follow – you simply type the name of the fish and it gives you a green, yellow or red dot, plus suggestions for good alternatives. It’s also a great idea to talk to your fish monger! Making fish sticks from scratch is quick and easy. Once you try them, you’ll never go back to prepackaged frozen sticks again! Combine all the ingredients for the dipping sauce in a small bowl; set aside. Preheat the oven to 450°F and adjust the rack to the center position. Spray a large rimmed baking sheet with oil. Slice the fish crosswise into 2-inch long strips, about 1-inch wide. Combine egg whites, Dijon mustard, lemon juice, paprika, salt and pepper in a medium bowl. In a second bowl combine the Panko crumbs with Old Bay seasoning, dried parsley and remaining paprika. Pat fish dry with paper towels and dip the fish into the egg mixture, then into crumbs and place on the prepared baking sheet. Spray the top of the fish with oil and bake until the crumbs are golden and the fish is cooked through, about 12 minutes, or until the crumbs are golden and the fish is cooked through. Preheat the air fryer to 370F. In batches, transfer to the air fryer basket in a single layer and cook until the crumbs are golden and the fish is cooked through, 7 to 8 minutes, turning halfway. 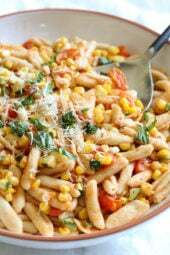 I have made this three times since I found this recipe… a couple weeks ago… I love it!!! what could you substitute for the egg whites ? Aquafaba is a common egg replacer. OMG this was so good! The fish turned out great – the seasoning was spot on and they turned out nice and crispy. What took it over the top was the sauce. I modified slightly by using 1 tbsp of dijon+2 tbsp mayo, added a touch of the caper juice with the capers and used dried chives instead of fresh. We licked the bowl clean! Best (healthy) tartar sauce ever. Will definitely make this again! Could you use this recipe but make the entire piece of fish filet? Loved these fish stick! Sauce was a geeat complement. Not surprised. Every Skinnytaste recipe I’Ve made has been delicious! My least favorite thing to eat is fish but I need the Omega-3s, so we thought we would give these a try and i am glad we did! Preparation was easy and the fish (we used cod) tasted fantastic! This will definitely be in the rotation. has anyone frozen these and then cooked? If so how did they turn out? I want to meal prep with them and just bake them each day at lunch because I don’t think leftovers would taste good. I LOVE Skinnytaste! I had trout fillets (skin on) and wanted to try a different recipe and came across this one. Mine were skin on, so I reduced the egg whites by one, and just brushed it on, then patted the panko topping on and baked. Turned out DELICIOUS and the lemon caper sauce is a KEEPER!! I have two of the cookbooks and need some time to pour over them. Thank you for noting WW points on the online recipes. Great recipe. I substituted blackened seasoning for the old bay and extra Dijon mustard. It was a great dinner served with roasted sweet and fingerling potato’s. And roasted veggies. I added the lemon and salt at the end to taste. My husband dislikes mustard. If I make fish sticks without mustard will the breading stick? Do you have an idea for a substitute? You can just leave it out. Can you make this with catfish? I haven’t tried, but as long as you like catfish I don’t see why not. Let me know if you try it! Hi! Does anyone know how many points just the sauce is? I served it with Gina’s crab cakes…. holy smokes, so delicious. Kristen, the recipe includes instructions for air frying. Anyone tried these in the air fryer yet? Any success??? First – thank you so much for all you do for us!!! Second, any suggestions for a side to serve them with??? Thanks so much! Already pre-ordered your 3rd cookbook!!! Forgot to add – I didn’t make the sauce. My kids like mustard and ketchup for dipping. If I ever make it though, I will substitute homemade cashew cream in place of the yogurt. I made this tonight for my kids and they loved it! I’m currently not eating eggs or gluten/bread products, so I made a portion for myself using coconut milk instead of the egg mixture, and curry powder and crushed rice cakes for the breading mixture. Delicious! I will be making this again. 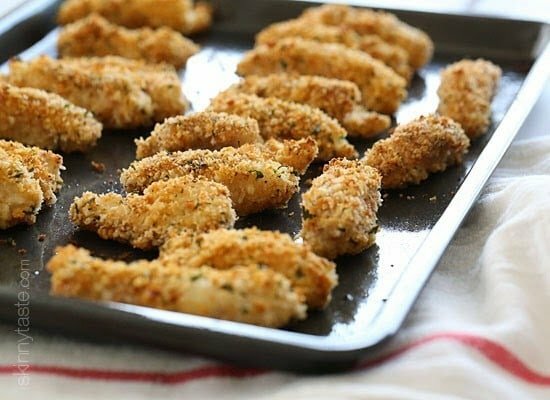 Can these be made in the air fryer? Could you please list the nutritional information and serving size for the sauce? These look super yummy and that sauce sounds amazing. I just need a meal between 400-600 calories for my eating plan. Thank you. Sorry I don’t have that handy! Can you make this in the air fryer? How long and what setting? 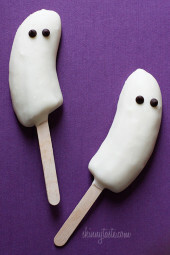 These look delicious and great for Lent! This was a HUGE success! My husband & daughter LOVED it. I should have doubled the recipe. I had 4 sticks & between the 2 of them they ate the rest. They loved the sauce so much they literally ate the rest with a spoon. Will definitely be making this again!! You’re right, these baked fish sticks are delicious and so is the Lemon Caper dipping sauce. We always buy fresh cod so these were a no brainer for us. However, we had no Panko the night planned to make these. LOL…we crushed Triscuit crackers for the breading, worked just fine and boy were they good. So happy to have a fish recipe that doesn’t require frying.P.S. Panko is on my grocery list! I made this with Salmon and placed on a pre-heated pan for 10 minutes in the oven. Fish was nice and crispy. The sauce was spot on but remember capers are very salty. I find this work very with whole wheat Panko. It’s nice to read reviews before I make, unfortunately so many people just post that they plan to make which doesn’t help me. There are recipes online for Old Bay substitute. Calls for bay leaf powder. I blended a bunch of Bay leaves and it turned into a powder. Will let you know how it turns out after tonight! Caper sauce smells divine! I made these a few times already and it’s a big hit for everyone here. Somehow mine don’t get golden brown after 12 minutes at 450 so now i usually bake them for 10 minutes and finish the last 2 minutes at broil. The oven doesn’t get much hotter but the direct heat give them a nice color. I have thaken quite the liking of the sauce as well, i now make it whenever i make salmon burger, it’s delicious! I just made these and they are AWESOME! I used whole wheat panko bread crumbs and added a little sea salt to the egg batter and to the crumbs and used two tsp of old bay instead of 1.5…i am a maryland girl! 🙂 Thank you so much for creating these and sharing them. I calculated that 5 of my sticks were 3 smartpoints (not including the sauce). Had them with Alexia Yukon Gold frozen french fries for a 6 point DECADENT dinner! Currently flash freezing the remaining 20 sticks to have for quick post-work, post-gym dinners in the next week or two. These were awesome, and I didn’t even have all the correct ingredients!! I had regular bread crumbs and mahi mahi. They were so delicious, I will be making them again!! Thanks for the great recipes!! I want to make this, however I don’t like capers. What can I use as a replacement? I count points (WW) and it says serving size + sauce but there's no point calculations for just the sauce? Help please! Made it today and it's s keeper! One question though-why use only the egg white? I subbed out 2whole eggs and it worked just fine. I used Panko and we liked the extra crunch. Added a little salt to the egg mixture. Fantastic! One of my favorite Skinnytaste recipes yet! These fish sticks are delicious. I tried them with haddock and they worked beautifully. And best of all, my daughter loves them. Thanks for a great dish! Can't wait to try these this week! Any side dish suggestions? How many calories do you think would be in each serving size if the sauce was taken out? Yummy yummy in my tummy:) I really loved how these tasted. I'm trying to eat more fish and also looking for more options where they had fins and tails. I used 1lbs of Cod but definitely didn't get 5 sticks per serving and I ended up with a whole bowl of leftover breading and pre-breading stuffs. Any idea what I could have done wrong? My boyfriend and I have gotten into the habit of making a couple of recipes on Sunday for the coming week, so that we have less temptation to get easy (bad for you) food after working a long day. We made this recipe and refrigerated (before baking) – it worked great, the fish came out very nice both days. I've never cooked with fish and I made this and it was awesome! My 3 yr old nephew couldn't get enough and it felt so good eating something healthy! Thanks Gina! I made this last night and it was so good! I almost did not make the lemon caper dip, not a big fan of lemon, but it made the meal. Thank you for this one! Wow, these were really remarkable. The combination of the seasoning in the breading, with the amazing sauce, was so good!! If you're considering this recipe but on the fence, I recommend it. Gina we loved the caper dipping sauce, honestly it really made the dish. Thank you. 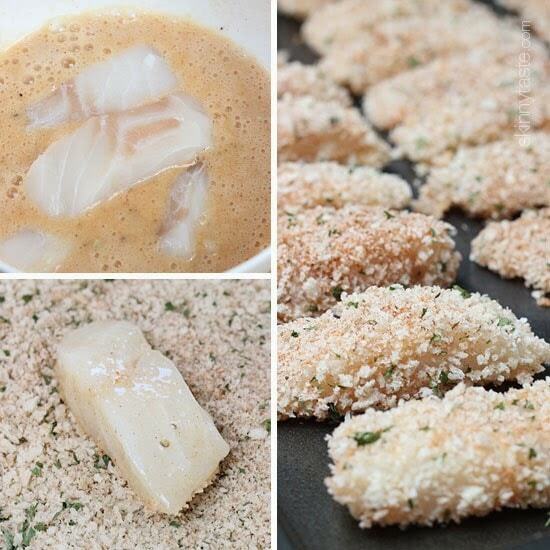 I just made these yesterday – used cod, all panko bread crumbs, and oh my they were soooo good! I think the panko makes them alot more crunchy. I srpayed my pan with oil before and again after I put them down on it and they were excellent. I have more of the cod left over for tonite's dinner and I am so making them again!!! Thanks Gina!! Can't wait to try this recipe this week! Could i substitute panko crumbs for regular italian bread crumbs? Would it be okay to use Halibut? I made these last night and the taste was really great. My only problem was that the breading fell off almost as soon as I touched them. The underside stuck to the baking sheet and then the rest would fall off when dipped in the sauce. Are there any tricks to making them more sturdy? Could you tell me how to make this more allergy friendly? No eggs, no dairy, no gluten. My grandchildren love fish sticks, but the ones that fit their criteria are so expensive. 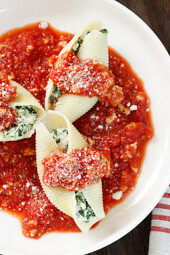 Love these recipe, it is definitely delicious! I love the sound of these. I will even try them with the lemon and caper sauce. Your recipes are great for those of us who HAVE to watch what we eat. Thank you for caring. I made this yesterday and it was delicous !!! This looks amazing! Would tilapia work? I'm not a fan of fish, but this looks like it could be done with chicken tenders!!! I love lemon and capers! 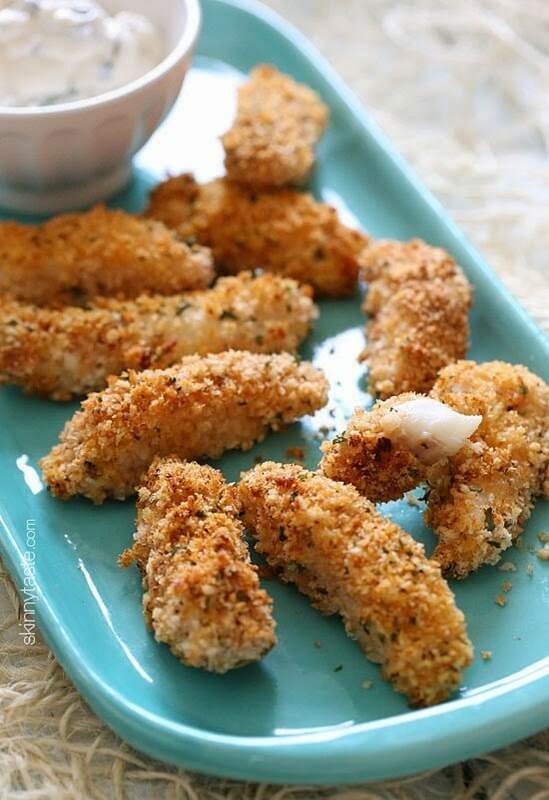 I love baked fish sticks – so much healthier than store bought, and you end up with a bigger batch! Great recipe. Cookbook ! Cookbook ! Cookbook ! I am soooooo ready (hungry) for your cookbook to become one of my own. I have been a follower of yours for years, before your little one was born even !!! I am a true Gina fan. You should NEVER reuse anything that has been in contact with raw meat/fish/poultry!!! You are asking for salmonella! Pat, listen to the nice lady above. That is definitely not safe food handling practices. You could get really sick! I don't know why…but I'm a bit afraid of cooking fish. Weird I know! I worry I won't get it done and I hate undercooked fish. With that said, I'm going to get over this phobia and put cooking fish on my bucket list! LOL This sound so good and as a Lifetime WW gal love the healthier option and the fact that the P+ are already figured. Thanks! Pinning it! Would tilapia work in this recipe? It wouldn't make good sticks, you could also use halibut, or any firm white meaty fish. I am allergic to yogurt. Does anyone have a suggestion as to what I can swap for the yogurt in the dipping sauce recipe? Thanks. I'm guessing that if you're allergic to yogurt you're probably allergic to sour cream as well. Try a vegan yogurt or coconut milk. It will give a different flavor, but will still be creamy. Thanks for the suggestions. There's something in the yogurt (maybe the cultures) that makes me really sick, but it's not a dairy thing….so I'll definitely try the low fat sour cream. Thank you so much! I have a similar app in Ducth and it's ideal if you want to know what to buy… And these fish fingers… They look perfect. I've not even made fish fingers…ever… But that is now gonna change ! Sounds delicious! I love how you brought up the app. It's definitely a staple for choosing my seafood. As an oceanographer, It's important to point out that the method of catching the fish (long line vs. trawl) really plays a HUGE role in how "sustainable" a fish is. From a health standpoint however, definitely check out the mercury and pcb levels too! Great, thanks for sharing. So much to think about when heading out to the store to pick up food for dinner, right? I like to make friends with my fishmonger and ask him, it also raises awareness. Yum! I love the sound of that lemon-caper sauce —I've been looking for springy recipes that don't give me the chills just looking at them (we had a snowstorm today and I can't remember the last time I wasn't freezing). This is definitely what I have been searching for! Could you recommend a seasoning substitute for Old Bay since we don't have this in Quebec, Canada? That's a shame. Try seasoned salt if you can find that. Old Bay is a salty/spicy seasoning. You could add more paprika and a touch of garlic powder. You can buy Old Bay seasoning on Amazon. com. I just looked it up for you. You can buy the equivalent of Old Bay seasoning in a lot of fish stores in Quebec. I've also found Old Bay in the Odessa fish markets. I don’t know for you guys but I’m from Montreal and there’s only this one fishmarket that sells old bay “Poissonnerie Shamrock” so it’s worth it ? Plus one of the cashier helped me with the sustainable fish ! Could this be used with Salmon ? I love the lemon caper flavor combination so I know I would love this dipping sauce! Does the calorie count include the dipping sauce? I am always confused when your recipes have a dipping sauce or topping, ie salsa, if the calories given include those sauces or toppings. Would like to have those calories listed separately. You can always calculate the calories separately on your own. Either using Myfitnesspal.com or the Weight Watchers recipe builder. Yes, it always includes everything in the recipe. The sauce you can divide by 4. I'm definitely making this next date night! Who doesn't love a healthy food dish?! Maybe I can tell my kid it's chicken sticks! Will try! Thanks so much for the app advice. These look so yummy! These look great. I am downloading that app as soon as I get my phone out of my purse…that will be so helpful when I'm in the store. Last time I gave up because I just didn't know what kind to get. Hi Gina- do these freeze well once cooked? I would probably freeze them before cooking. Bread them, then freeze and you can bake them frozen.